In anticipation of our annual summer block party here on 11th Street, I made Lemon Cream Cake from the June 1957 Capper's Farmer magazine. I don't have the magazine, but one of "my ladies" -- those whose recipe cards and scrapbooks I bake from -- had clipped it for her recipe box. But we (my cake and I) never made it to the block party on account of a late afternoon rainstorm (the invite said "shine only"). And when the skies finally cleared, I had plans to head to the Abrons Arts Center to see Dirty Martini and the New Burlesque, a documentary film on New York's neo-burlesque scene, followed by live performances by Dirty herself, Julie Atlas Muz, Bambi the Mermaid, World Famous "BOB," Tigger! and others, all MC'd by Mr. Murray Hill. The show was superb, as was the after party at The Delancey, as was this cake. In fact, I'm burying the lede -- this cake is a real winner. Next time someone asks what cake is my favorite, I might just say this one. The ratio of ease to deliciousness is unmatched. Anyone can make this cake -- it's really foolproof, and it's very impressive. It uses heavy cream instead of butter, and I beg you please not to buy the ultra-pasteurized crap cream at the supermarket. It's worth the money to buy sweet fresh cream at the farmer's market or from a local dairy. Sticking with the cream theme, I used this lovely cream cheese frosting recipe, below, that was the perfect topping for this cake. So what happened to the cake? While my neighbors didn't get any (maybe I'll make it for our annual Christmas party), my co-workers at Henry Street Settlement sure weren't complaining about the Sunday afternoon rainstorm! 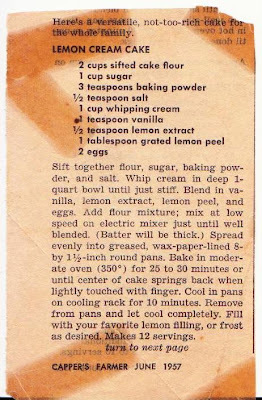 I love lemon cake, so I was wondering how "lemony" the flavor is here. Seems to have enough flavoring, but what did you think? BTW, I like your blog! Found it through 4 Pounds Flour. Thanks, Julie! Yes, it is quite lemony (but not overwhelmingly so), between the extract, the zest and juice. Thanks so much for the kind words -- just checked out your blog and it is amazing. I'm going to try the broccoli soup because it sounds so good (and I'm not a big broccoli fan). I just had dinner with Sarah of FourPoundsFlour. Blogging -- the great connector, eh?